and national pride among local folk. It’s all in honour of Dewi Sant – St David – but not much is actually known about the patron saint himself. 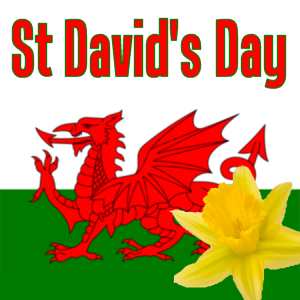 Happy St David's day translates to Dydd Gwŷl Dewi (Sant) hapus. Legend has it that he went on a pilgrimage, which led all the way to Jerusalem, where he was made an Archbishop. His miracles, though, happened closer to home – people began making their own pilgrimages to St David’s Cathedral, which he founded in West Wales, after word swiftly spread of his ability to make the earth rise beneath him, suggesting a power which could ward off the invading Normans. According to legend on the eve of the battle against the Saxons St David advised the Britons to wear leeks in their caps so as to easily distinguish friend from foe. This helped to secure a great victory. Today Welsh people around the world wear leeks on St David's Day. It is also a surviving tradition that soldiers in the Welsh regiments eat a raw leek on St David's Day. The Welsh for leek (the original national emblem) is Cenhinen, while the Welsh for daffodil is Cenhinen Pedr. Over the years they became confused until the daffodil was adopted as a second emblem of Wales. Our national flag - The Red Dragon (or in Welsh Y Ddraig Goch) - was granted official status in 1959, but the dragon itself has been associated with Wales for centuries. Some say it’s the oldest national flag still in use, and that it was used by King Arthur and other ancient Celtic leaders. The harp is regarded as the national instrument of Wales. By the end of the 18th century, the triple harp - so called because it had three rows of strings - was widely known as the Welsh harp on account of its popularity in Wales. The harp has been used through the ages as an accompaniment to folk-singing and dancing and as a solo instrument. HRH Prince Charles appoints a Welsh Royal Harpist on a scholarship programme annually. Past Royal harpists include Catrin Finch. The Crest of three ostrich plumes and the motto "Ich Dien" (I serve) were adopted by Edward the Black Prince at the Battle of Crecy. Edward became Prince of Wales in 1343, and was a popular leader - so much so that thousands of Welshmen joined him to fight in the French wars. In fact, a quarter of Edward's troops were composed of Welsh archers and spearmen. The crest is used today in royal heraldry and the feathers still adorn the badge of the National Rugby Union team of Wales.